What version of software is your Android device running? If you haven’t updated recently, there might be a new version available! Typically your phone carrier will provide Over-the-Air (OTA) updates so that you can upgrade automatically and wirelessly. You could drive to your carrier’s brick & mortar store to have them update it, or you could just check for for these updates yourself and save some gas money! Below we’ll show you how to check for updates, and explain what the terms PRL, Firmware, and Profile mean. With that said, the interval between update releases will vary depending on the manufacturer that made your phone, and the carrier that provides your phone service. You might not find any updates available when you check for them. In any case, it isn’t easy guess or find out when exactly updates will release, so it is good idea to check for updates provided over-the-air every once in a while. Note that the screenshots in this article were taken using a Samsung Galaxy Epic 4G, menus may vary depending on the manufacturer of your device. 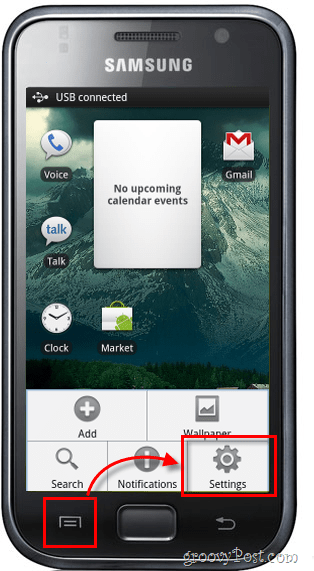 While on your Home Screen, Press the Menu button on the outside of your phone. A small menu will appear, Tap Settings. In the settings menu, Tap About phone. These updates will install new versions of the software that is built-in to the hardware of your device. 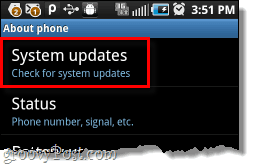 These updates should be considered very important, and whenever you install them be sure that you have decent battery life, or your phone is plugged into a charger. You typically never need to update your profile unless your carrier is making changes to your service. A profile contains your wireless username and password and is used to connect to your carrier’s wireless data network. Preferred Roaming List, or PRL, is your phone’s database of cell phone towers and connection points that are available through your provider and roaming partners. You could think of it as a list of access points. Since you are reading this article, you likely have an Android phone. Android is your operating system, aka the software that powers all of the apps that run on your phone. If an update is available for Android it will generally send you an alert through your home screen, so you shouldn’t ever need to check this. 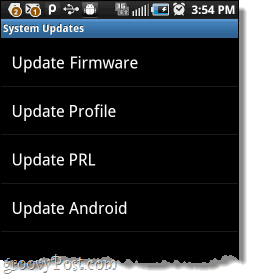 You can check all of these updates as frequently as you like, but the two important ones to update are the Firmware and PRL. Checking for OTA updates on your Android phone is really easy! Just remember when updating to make sure you have enough battery life left to make it through each update. Note that often OTA updates will arrive sporatically. Cell phone service carriers generally never deploy updates to all users simultaneously. A wave of updates puts a large data strain on the network, and so updates are randomly sent out to only a number of people per geographic area at once. Don’t want to wait for the updates to roll out over-the-air? You can typically just visit your phone manufacturer’s website and update manually. If you’d like help finding updates for your phone, feel free to ask any of the groovy geeks here at groovyPost by using the Community Forum or the comment section below.